A few weeks ago, I asked the readers to please forward me any info on Steeler offseason basketball games. To the best of my knowledge, there's no schedule of all the games on the web, so I'll do my best to keep up with them. I attended one last year and it was really a nice event for a good cause, so I highly encourage you to check it out if and when a game comes to your area. The game I watched featured Najeh Davenport and Max Starks, and other games have had appearances from bigger stars such as Ben Roethlisberger and James Harrison. 13th Annual Cops and Kids vs. the Steelers Basketball game, 7 PM, Carrick High School Gym. *Bonus: Mayor Luke Steelerstahl will be suiting up for the police team! Steelers vs. Howard Hanna Real Estate Services, 8 PM, Canon-McMillan HS gymnasium. 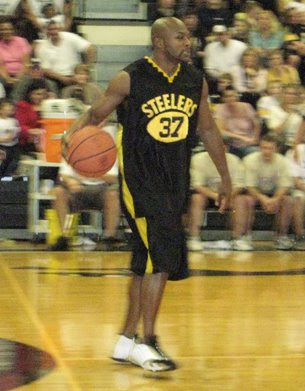 Steelers vs. Monessen High School faculty, time TBA, Monessen HS gymnasium. Steelers vs. Slippery Rock University faculty, 8 PM, Morrow Field House.